The revolving door that is the payday lending debt trap is real. The high-interest, short-term loans may even be more damaging to consumers that previously thought. Four out of five payday loans are rolled over or renewed every 14 days by borrowers who end up paying more in fees than the amount of their original loan, a new Consumer Financial Protection Bureau report finds. A CFPB report “CFPB Data Point: Payday Lending” [PDF], a continuation of the payday loan investigation it began in 2013, details how the predatory practice of payday lending grips consumers who stand little chance of breaking free. The Bureau based its findings on data from more than 12 million storefront payday loans made during a 12-month period .” When a borrower rolls over or renews a payday loan they must repay the fee assessed to the original loan in order to extend their financing by two more weeks. The CFPB found that by renewing or rolling over loans the average monthly borrower is likely to stay in debt for 11 months or longer. 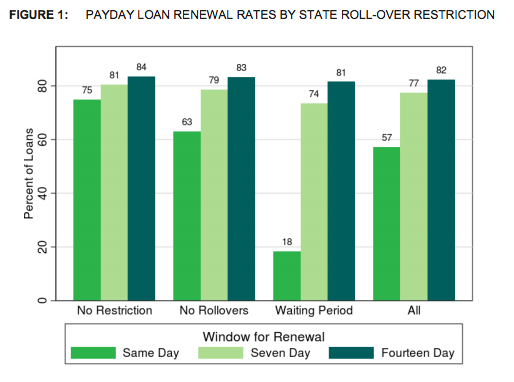 More than 80% of payday loans are rolled over or renewed within two weeks regardless of state restrictions. The CFPB looked at three different types of state regulation on payday loan rollovers: Mandatory waiting periods between rollovers, no rollovers, and no restrictions on rollovers. In each case, more than 80% of the loans were rolled over by borrowers within 14 days. With a typical payday fee of 15% rolling over and renewing loans significantly increases the amount a borrower owes. In fact, three out of five payday loans are made to borrowers whose fee expenses exceed the amount they borrowed in the first place. 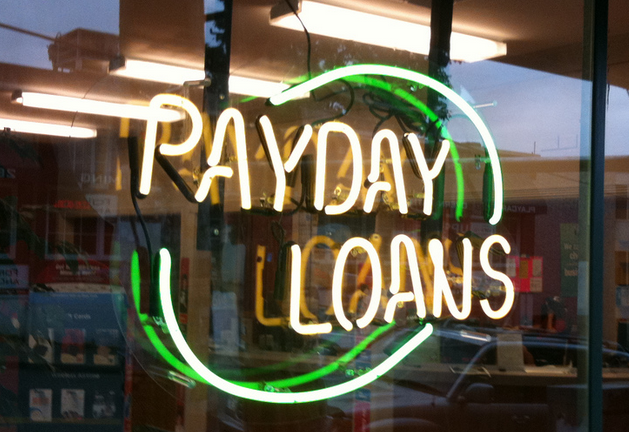 More than 60% of payday loans are made to borrowers who take out seven or more loans in a row. While half of payday loans are repaid after a maximum of one loan renewal, nearly a quarter of them require seven or more renewals, and 15% of loans extend for 10 or more renewals. Repaying a loan has become increasingly difficult for borrowers. Only 15% of borrowers were able to repay their debt when it was due without re-borrowing. However, 48% of initial payday loans were able to be repaid with no more than one renewal. The new report not only provides startling numbers regarding consumers caught in the payday loan debt trap, it also confirms many of the concerns consumer advocates have recently voiced. The report found that states with cooling off periods, a time frame in which a borrower can not take out another payday loan, have renewal rates nearly identical to states without limitations. 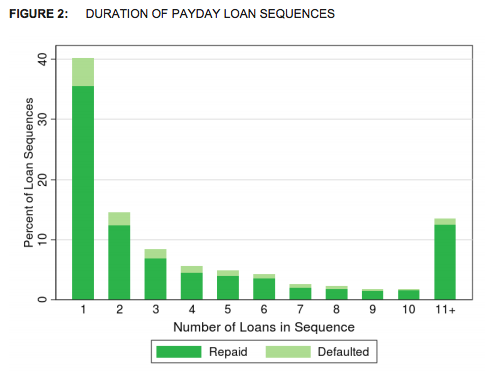 The finding seems to support consumer advocates claims cooling off periods do nothing to stop the payday loan debt trap. For years, consumer advocates have been calling on federal regulators to rein in payday lenders. While many states have created their own restriction, many even prohibiting the lending practice, federal regulators have thus far done little to provide meaningful protection to consumers when it comes to traditional payday lending. However, earlier this year new federal banking regulations went into effect that essentially caused banks like Wells Fargo and U.S. Bank to discontinue their payday loan-like direct deposit advance programs. One alternative currently being explored involves the United States Postal Service entering the financial services arena. Sen. Elizabeth Warren even endorsed the idea of allowing the USPS to extend basic banking needs to consumers. The CFPB will discuss their findings during a payday loan field hearing in Nashville, TN, this afternoon.